In the beginning, not only was the Farm Trust focused on creating sustainable success for regional farms but also on ways to make the program sustainable so they can provide solutions long term. “Profitability is the biggest part in the sustainability equation. If it is not profitable it is not sustainable,” said Wyatt. 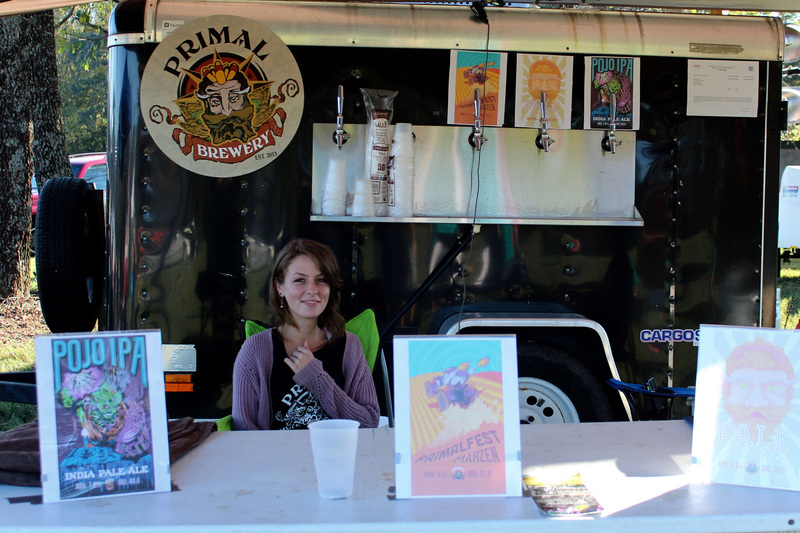 The festival proudly sources locally as much as possible, which is close to 100% of the time. 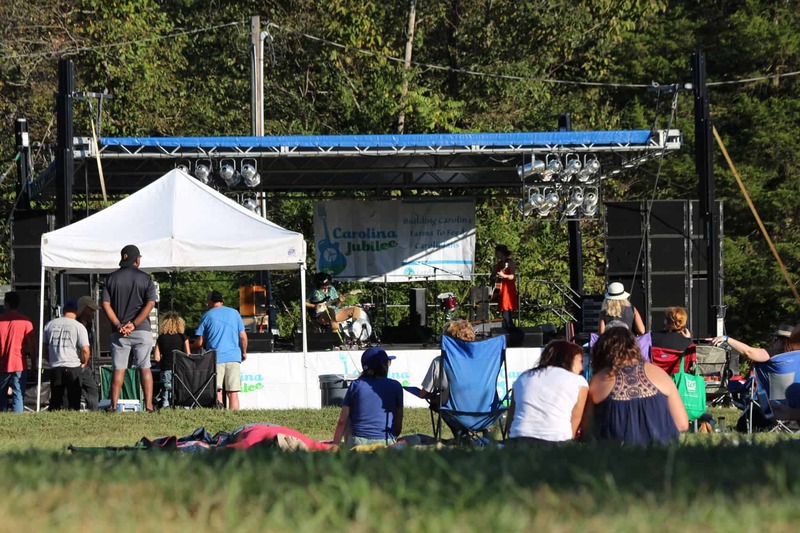 This is emphasized down to the smallest detail, like choosing to provide bottled water for the festival from Midas Spring Water Inc., a company out of Huntersville, instead of a national brand that would likely be more cost effective. It is important that all aspects of the Carolina Farm Trust are in line with their mission. The design of Carolina Jubilee is to create a fun opportunity for people to come together to support Carolina agriculture and to highlight the importance of businesses who are using Carolina farmers as a part of their supply chain. “These businesses are making a big difference. A restaurant that is sourcing 10% locally should be applauded and not looked down upon for not doing more. Do you know how hard it is to do that in the first place? All this local and organic push is a movement that has real cost to it while the benefit is not so easily measurable. Even sourcing something like 10% locally may seem like a small amount but it is so impactful for the farms,” said Wyatt. The central location of VanHoy Farms in Harmony sits strategically within two hours of every major city in North Carolina aside from the far East Coast. 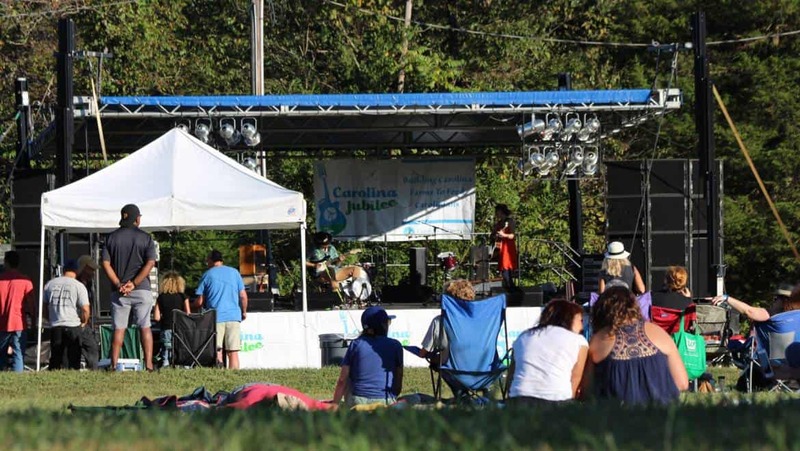 The Carolina Jubilee encourages people from urban areas to go into rural ones, with only the option of supporting the businesses that surround them, to engage with each other, and have fun! “Our country is very clearly divided between urban and rural landscapes and instead of talking about the divide we need to go to it. That is why the festival is in Harmony. Regardless of differing views and affiliations, when the average person in a calm environment interacts with another it isn’t going to be hate-driven. It’s going to be intrigue and conversation,” said Wyatt. All of the festival’s music this year is from the Carolina’s. Eighteen bands over two days will play beginning Friday, September 29, at 1:30pm until about 1:30am. Music starts at 11am on Saturday, September 30, and will go until 2am. Some of the featured bands are Susto of Charleston, who will be rounding off their festival-packed summer tour, and Acoustic Syndicate, the NC bluegrass and rock band. Other bands include The High Divers, Sinners & Saints, Amigo, and more. “We had a bonfire right in front of the stage last year. What venue are you going to go to where you can throw a bunch of sticks in the middle of a field and light it on fire?” said Wyatt. As for food, there will be a selection prepared by some of the Carolina’s best chefs including Chef Clark Barlowe from Charlotte, Chef Regan Stachler from Durham, Chef Harrison Littell from Winston, Chef Njathi Kabui from Apex, NC. All chefs will craft creations under an “open fire” theme. Chef Clark will have four hotdog options including a lamb dog, pork dog, beef dog, and a vegan dog from foraged mushrooms. Chef Harrison wants to do something with pork and Chef Regan is interested in water buffalo. Additional food options will be provided by Norm’s Farm, King of Pops, and others. Also under consideration is a sort-of market with food for purchase that could be prepared after hours. To wash down all of the incredible eats, the Jubilee will host a solid variety of Carolina-bred breweries and distilleries. 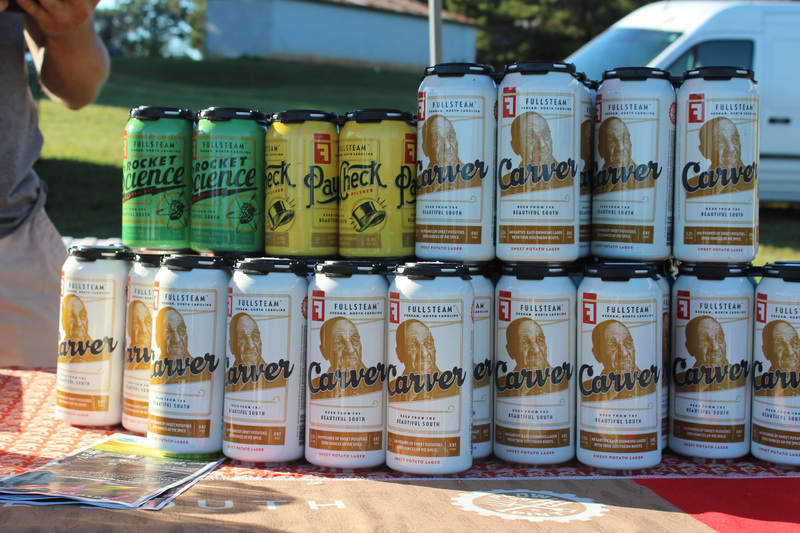 Fullsteam Brewery, Primal Brewery, Fair Game Beverage, Topo Distillery, and Durham Distillery will all be back and another four will be added including Copper Barrell. Kel Minton from Soul Gastro will be the mixologist again. 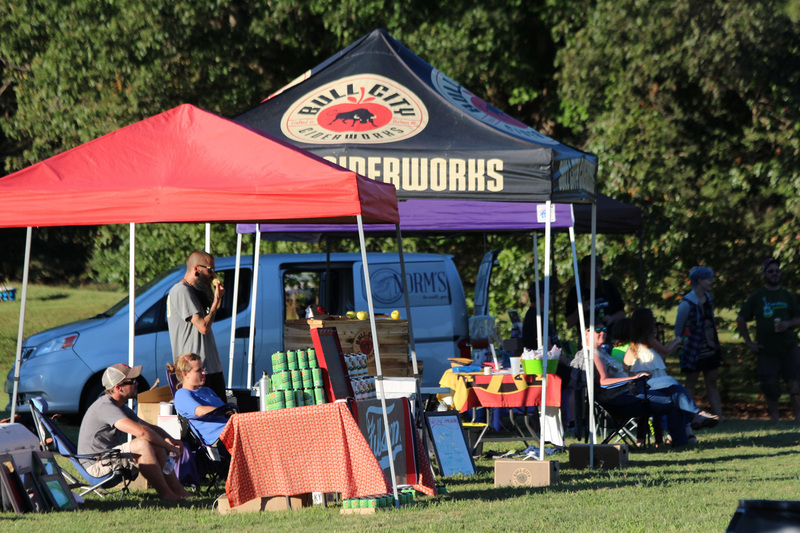 In between bands, attendees can peruse a variety of vendor wares, take a tour of nearby Howard Farm, or get their hands into a community art project. There will also be a 5k/10k Saturday morning at 9 that will wind around some of the surrounding farms. If you’re wondering where to stay for the two-day fest, camping is supported and encouraged! The farmland, situated so far from city lights that you can see the Milky Way, is outfitted with amenities like showers and RV hookups. And, don’t worry, there will coffee both days, provided by Summit Coffee, to help ease the late nights and early mornings. The Carolina Jubilee is offering a ticket campaign-collaboration with nonprofits and farmers markets who are interested. If the organization markets tickets through their channels they get discount codes and a revenue split. 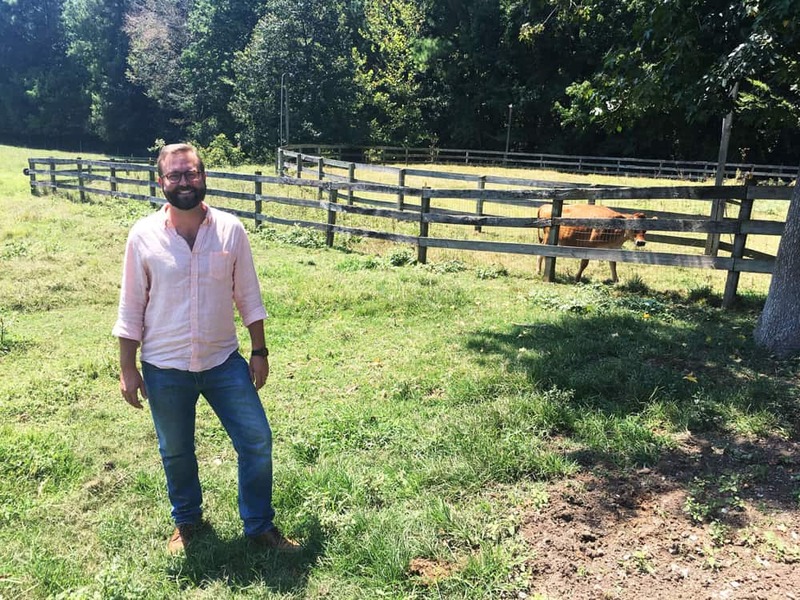 Sustain Charlotte is on board, as well as Catawba Riverkeepers, Yadkin Riverkeepers, Charlotte Food Policy Council and a handful of farmer’s markets around the state. Pricing for the festival is $35 for a single-day ticket and $55 for a two-day pass. Kids 15 & under are free. The fees for the run, which are not included in the ticket price, are $7 for the 5k and $12 for the 10k. Camping is $10 per person. Though there will be plenty going on, the goal is not to have a schedule packed full of activities. The Carolina Jubilee is a chance to get away from the everyday hustle and bustle, remove distractions, and create a true experience where people are engaging with other people. It is communities supporting their own communities. “I am asking people to take a bet on us. Take a bet and spend a day with us this year and give us the opportunity to do something really special. I fully believe that we can make a difference in the way Carolina agriculture is done today but I need the community to do it. It is a social contract between us and the people of the Carolinas and surrounding regions. The only way this is going to work is if the larger community engages,” said Wyatt.